Maybe it's because I was recently delving into my high school mix tapes or maybe it's because I have a knack of remembering my food "firsts," but when I sat down to my two-day-old minestrone, I remembered my first minestrone and I remembered Suzanne. We're still very close friends (and she's not dead or anything), so it's not like I needed any reason to remember Suzanne -- especially since she figures heavily in my mix tape memories -- but minestrone and Suzanne are inextricably linked for me. I don't remember the year, but I remember the month. It was Valentine's Day and a bunch of us were protesting not being asked to a Valentine's Dance by certain boys by having a huge girls gathering. We were all at Suzanne's house where her parents humored us by giving us the dining room and letting us eat off the fancy china. Suzanne, the cook of our group, made a huge, steaming pot of minestrone on that frigid Minnesotan night. I'm sure we had bread and salad, too, but I don't remember that. I just remember the minestrone. Given that minestrone is chock-a-block with vegetables, I was already not a fan. Without tasting it, I was against it. But I didn't tell Suzanne that. Suzanne had made me a special birthday pizza topped only with onions and cheese because she knew how much I loved onions. I wasn't going to tell her I was sitting out her protest minestrone because I hated zucchini. And carrots. And cooked tomatoes...and pretty much everything else in it. Anyway, everyone else was pro-minestrone, and I didn't want to broadcast my pickiness, because in high school? You don't go against the grain. I sat down and quietly unfolded my napkin. Then I quietly took a small taste from my spoon. After that, I quietly finished my portion and quietly ladled out more. Quite soon, I was ordering minestrone at lunch whenever Bruegger's Bagels had it. But it was never as good as Suzanne's. This month, I had a reason to make minestrone for the first time. A few days before my mother-in-law flew out for Thanksgiving, I recited the contents of our Mariquita Mystery Box to her over the phone. As soon as she heard we were getting butternut squash, baby leeks, and chard, she told me I should think about making Alice Waters' fall minestrone from The Art of Simple Food. She even brought me a Ziplock bag of the necessary sage, rosemary, and bay leaf fresh from her Virginia garden. So, of course, I made the minestrone. I soaked and cooked the Rancho Gordo borlotti beans, I peeled and diced the butternut squash, and I washed and ribboned the chard. And then I left it alone for 24 hours because soup, pasta sauce, and onion dip are always better after 24 hours. I suggest you serve with crusty bread, a cold night, and warm memories. 1. Heat the oil in a large pot over medium heat. Sauté the onion, carrots, and celery for about 15 minutes. Add garlic, herbs, and salt and cook for another 5 minutes. 2. Add the chard and tomatoes and cook another 5 minutes. Add the water and leek and bring to a boil. After the boil, bring the heat back to medium, and cook for 15 minutes. 3. Add the butternut squash and continue cooking until it is tender, about 10 minutes. Next, add the drained borlotti beans along with 1 cup of the bean cooking liquid. 4. 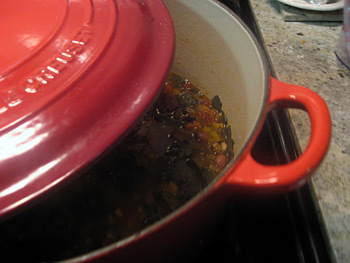 Over low heat, gently warm the beans and their liquid through, about 5 minutes. 5. Taste and adjust seasonings to your preference. (I like to add a few fresh grinds of black pepper.) Remove bay leaf before dishing out. 6. Garnish each bowl with 2 tablespoons extra-virgin olive oil and 1 tablespoon (or more) of freshly-grated Parmigiano-Reggiano cheese.